To follow up a good practical example of a our Masterclass on Water Productivity, our colleague Nadja den Besten went on a mission to Quelimane in Mozambique. 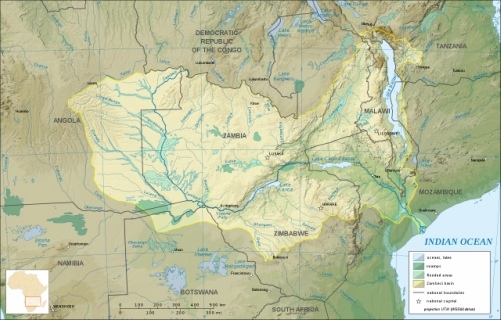 FutureWater was invited to assess project APROVALE, Água Produtiva no Vale do Zambeze, in the Zambezi Valley. The project is led by Agencia de Desenvolvimento do Vale do Zambeze (ADVZ), which is a governmental organization linking commercial and public initiatives to primarily promote agricultural sustainable growth. Zambezia is a very important agricultural province in Mozambique, besides Maputo province, the most populous as well. In the last decades the agricultural productivity did not increase in Zambezia. The majority of the increase in agricultural output was due to an increase in agricultural area. In order to sustain coming generations and resources, water productivity plays a key role in improving current agricultural practices. Project APROVALE therefore challenges a few different areas, spread all over the Zambezi Valley, to improve their practices by simple interventions. Think of sprinklers, furrows, proper land-levelling etc. In all of these so-called “water productivity” areas, the project wants to keep track of the water use to in the end calculate how much drop per crop is used. To in the end showcase the best practices to other farmers. Though it sounds easy, it is not so straightforward to keep track of your water use in a lot of different areas with limited monitoring resources. Therefore, FutureWater was asked to assess collaboration opportunities to work together on monitoring the evapotranspiration in different areas of their project, as well as implementing ThirdEye in their agricultural practices. The short field visit showed how remote sensing can be key in visualizing the project and calculating the impact of interventions. FutureWater is looking forward to further collaboration!